Librarians spend their lives weeding. Not weeds, but books! Books that have reached the end of their shelf life, both literally and figuratively. They remove the ones that patrons no longer check out, and they put back the ones they treasure. 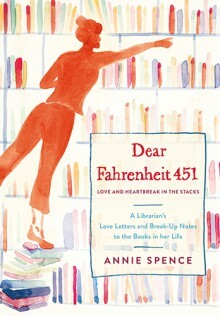 Annie Spence, who has a decade of experience as a Midwestern librarian, does this not only at her Michigan library but also at home, for her neighbors, at cocktail parties—everywhere. In Dear Fahrenheit 451, she addresses those books directly. We read her love letters to Just Kids and Frog and Toad Storybook Treasury, as well as her break-ups with The Giving Tree and Dear John. Her notes to The Goldfinch and The Time Traveler’s Wife feel like classics. Through the lens of the books in her life, Annie comments on everything from women’s psychology to gay culture to health to poverty to childhood aspirations. Hilarious, compassionate, and wise, Dear Fahrenheit 451 is the consummate book-lover's book.